Albion Village Hall is located at 35-27 East Bank Street, Albion NY 14411; phone: 585-589-9176. Photo: Tousley-Church House, ca. 1840, 249 North Main Street, Albion, NY. 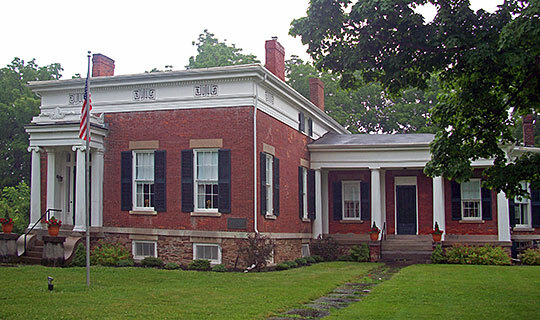 Listed on the National Register of Historic Places in 2001. Photographed by User:Daniel Case (own work), 2010, [cc-by-3.0 (creativecommons.org/licenses/by/3.0)], via Wikimedia Commons, accessed October, 2014. The village of Albion lies mainly in the Town of Albion, and partly in the town of Gaines. It is approximately 30 miles west of Rochester and 50 miles east of Buffalo. The village was first named Newport, after Newport Rhode Island. There was another post office with the same name in New York, and the trouble and confusion of receiving mail induced the inhabitants to change the name at the time the village was incorporated about 1828. It was derisively called Mudport by the residents of Gaines, because of the condition of its streets in wet weather. Until 1875, when Albion Township was formed, the village was within the Town of Barre. It contains one Presbyterian and one Methodist Church, a high school, a seminary for females, a court house of brick, a neat edifice in which are the county offices, erected upon the public square; a prison of hewn logs, a bank, incorporated in 1834, with a capital of $300,000; four forwarding and commission houses, thirteen dry goods stores, one book store, two tanneries, one ashery, two grist mills, three saw mills, one carding and cloth dressing mill, one furnace for casting iron, four taverns, one wholesale and several retail groceries, various mechanics, nine lawyers, and five physicians, two printing offices, two hundred and twenty-one dwellings of brick and wood, many of which are large, neat and commodious. The population then was about 1,100. A Gas Light Company was formed in 1856, and a Water Works in 1887.